Kids can create amazing works of art! 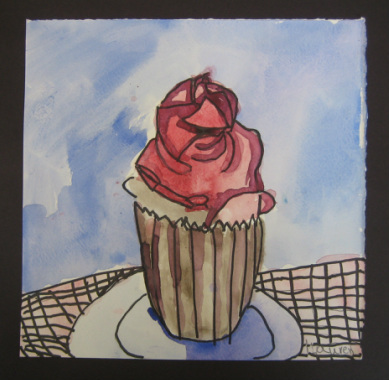 Students learn basic, solid skills, artist's 'tips' and receive encouragement all along the way. Classes are structured, yet geared toward the age and skill level in each class. Browse my portfolio to see a wide variety of my own work - created over the past 20+ years. Materials are included. Register for the grade your child is entering in the fall. Classes are limited to 6-8 students and are held at my home/studio in Winfield, IL. E-mail me to be put on the waiting list and/or to be notified when another Minecraft workshop is scheduled. The best part of Minecraft is the continual building, creating and storytelling. On graph paper, I will show students how to draw their own characters and worlds with 3-D boxes and how to create depth and perspective in their imaginary world. Each student gets to take a small graph paper sketchbook home - to continue to explore his or her imagination throughout the summer. clear close-ups are the best. Students, grades 6-9, may want to extend their time until 12:30 to have the opportunity develop the drawing further. $10. If you know me, you know I love to paint flowers! 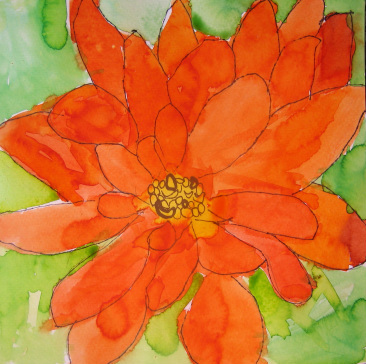 This week we will celebrate our favorite blooms by mixing colors using pastels and paint. Get ready for bold and beautiful! New projects for this summer – including colored pencil and watercolor on a tile! Yep, this week rocks! We will be creating a 3-dimensional colored pencil drawing of a precious gem, a cross section of a slice of agate in oil pastel, and a papier-mâché sculpture of a geode. Sparkles included. Claes Oldenberg, Chuck Close and Andy Warhol are artists who became famous for taking everyday subjects and making them larger than life. Beginning with a series of small sketches, students will discover what happens when an artist drastically changes the scale of their subject matter. They will problem solve to choose their favorite sketch, transfer the image to an 18”x24” or 20”x20” canvas, select and mix colors, maneuver acrylic paint, balance values, create visual interest and arrange a dynamic composition. To add another class or another student, click on 'continue shopping' after adding a class to your shopping cart. This art adventure takes us to a world of knights and castles, princesses and dragons. While feeding the imagination, students will get even better at drawing people, creating texture and developing depth in a picture. Gold and silver paint will be involved. We are on the look-out for Africa’s Big 5: Elephant, Rhino, Leopard, Lion and Cape Buffalo. With these animals as our inspiration, each student will create an animal portrait, paint an African landscape, and build a 3-dimensional paper-mâché animal mask. Create an acrylic painting of your name, or an inspiring word, on a 10”x20” or 8”x24” canvas. Express yourself with color, pattern and font (style of lettering). It will be ready to hang when you take it home! This is the drawing class for those students who just want to use the point of a pencil or thin sharpie. For 3 afternoons, we will learn shading techniques, develop 3-dimensional forms (making things look 'real'), and create interesting textures. To see examples of what my students' have created in our class times together, click here. This will take you to the 'Students' Work' category of my blog. You can also visit me on my Facebook page - Art by Dawn Eaton. Classes are held in my home/studio in Winfield, IL.